Hello Friends, thanks so much for your get well wishes. I am not feeling any better today, but I am hanging in there (by a thread, pun intended, ha!) 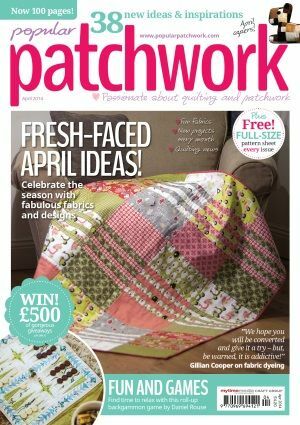 Nonetheless, I am most excited to share with you my “joint venture” feature with Lynette Anderson in the latest issue of Popular Patchwork (April 2014), a UK publication! 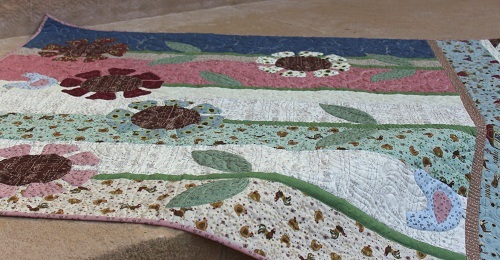 A special thank you to Kay Harmon for constructing the quilt top so that I could jump right into quilting it. 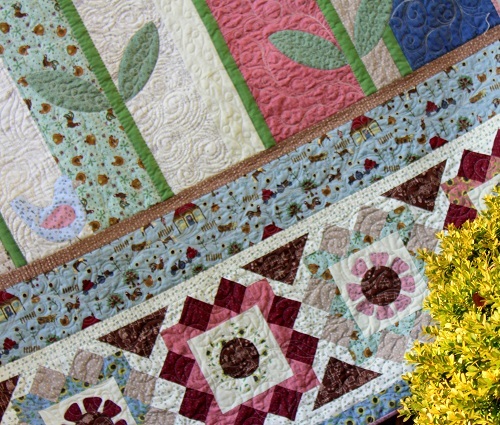 Lynette added the applique portion to my pieced design, and made the quilt into a really fun one! 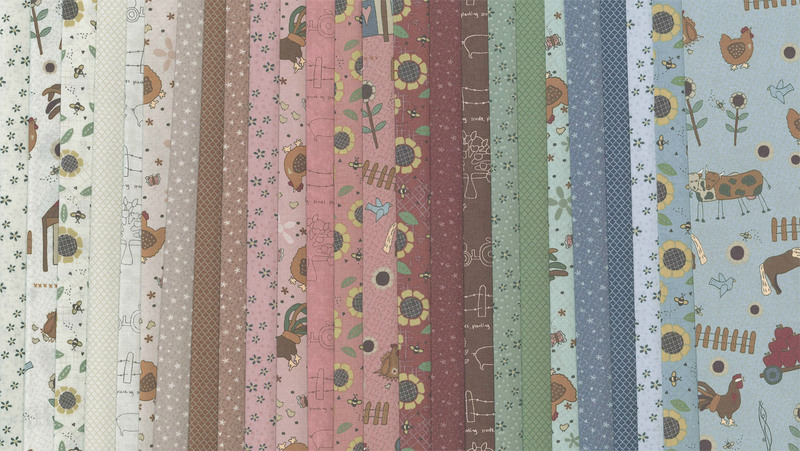 Mending Fences uses fabrics from Lynette Anderson’s Mending Fences fabrics. 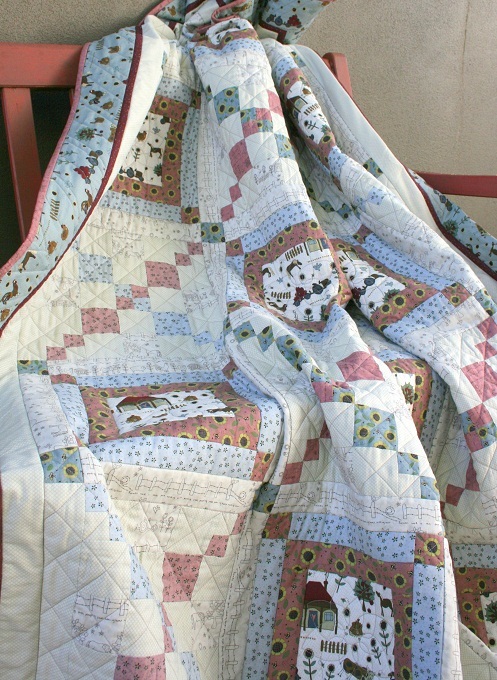 You may recall I already have two other featured quilts, both named Farm Crossing, made using fabrics from the same collection. 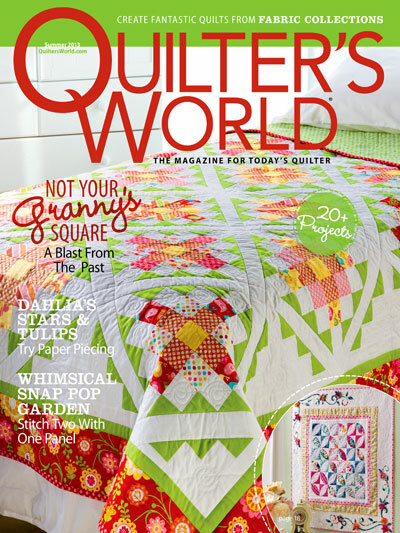 Click here, and here to view additional quilt photos, and for information on the magazines in which the quilts are featured. 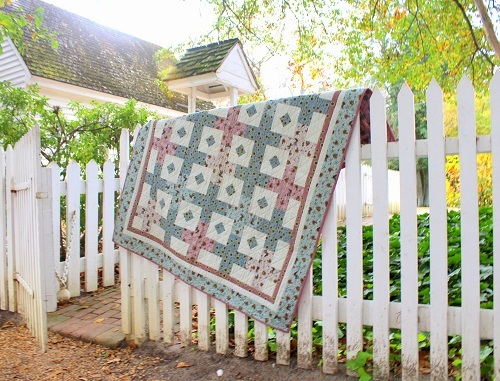 Now back to UK Popular Patchwork’s Mending Fences quilt… this quilt afforded me many opportunities to do some fun quilting. The following pictures will show you what I mean. 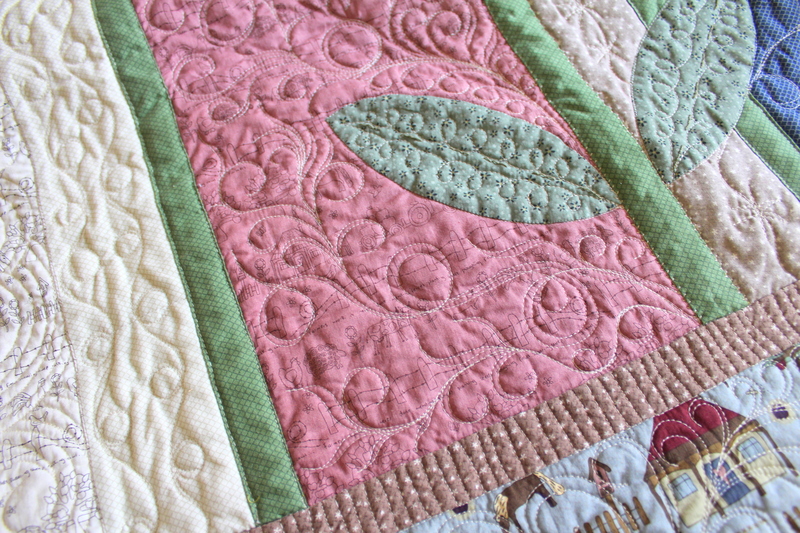 Quilting is done using Aurifil Mako 50 cotton threads over Hobbs Tuscany Silk batting. 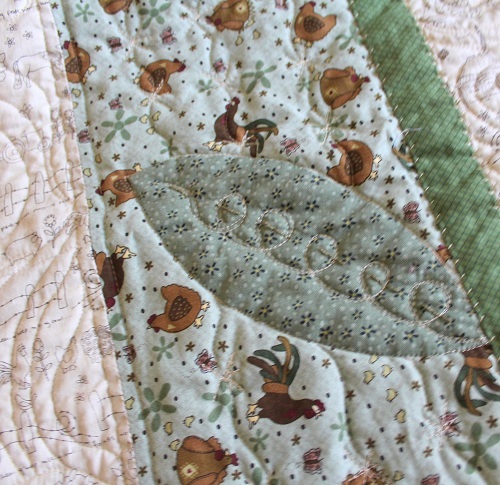 The quilting is done totally unmarked and free-handed. See what I mean about the quilting being “fun”? Can you tell I thoroughly enjoyed the quilting the quilt? 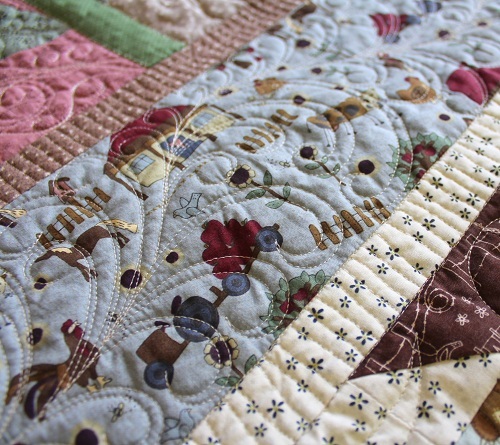 There are many things I like about this quilt, but I think what I love best is the feel of coziness that permeates throughout. 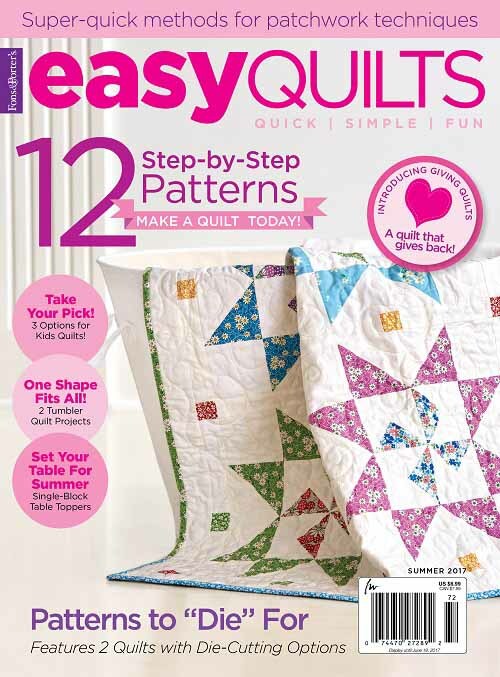 Now, I am not sure where one could buy Popular Patchwork issues in the States. If you do, please let me know! Thanks for stopping by. I would love to hear your thoughts on this quilt. Hugs to you all. p.s. 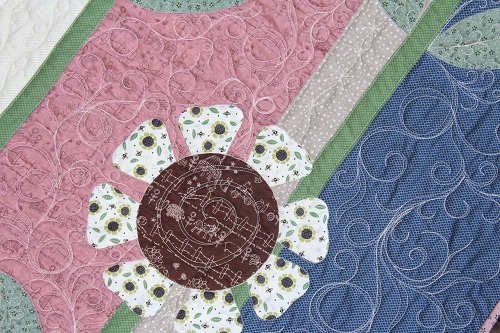 I am still waiting for favorable weather conditions to take pictures of my other currently featured quilts. Stay tuned for details. 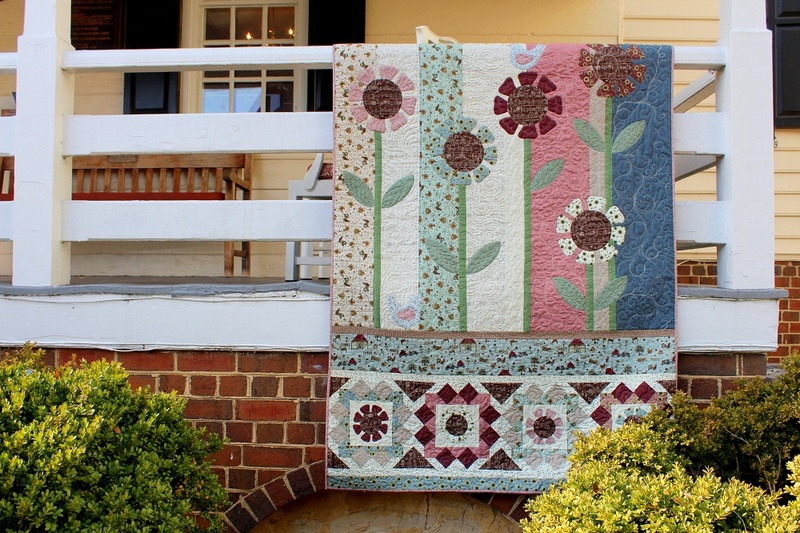 This entry was posted in Quilt Pattern, Quilting, Quilts & Projects: Published, Quilts: Pieced & Applique and tagged Applique Quilt, Lynette Anderson Mending Fences, UK Popular Patchwork April 2014, Wendy Sheppard Designs. Bookmark the permalink. ← WELCOME, Oh! Happy Stars Sneak Peek and This & That! Great job! Kay is great. Especially on applique! What a wonderful fun quilt! It made me smile just looking at it! Your quilting is, as usual, superb! I do hope you start feeling much better soon! 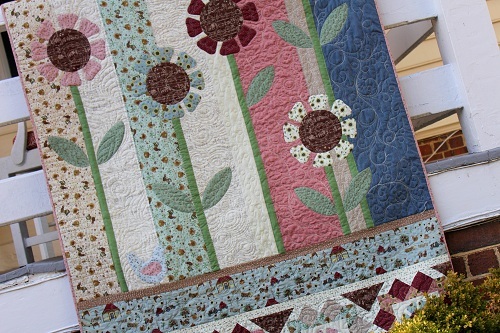 What a sweet design that is perfect to show off free-motion quilting. 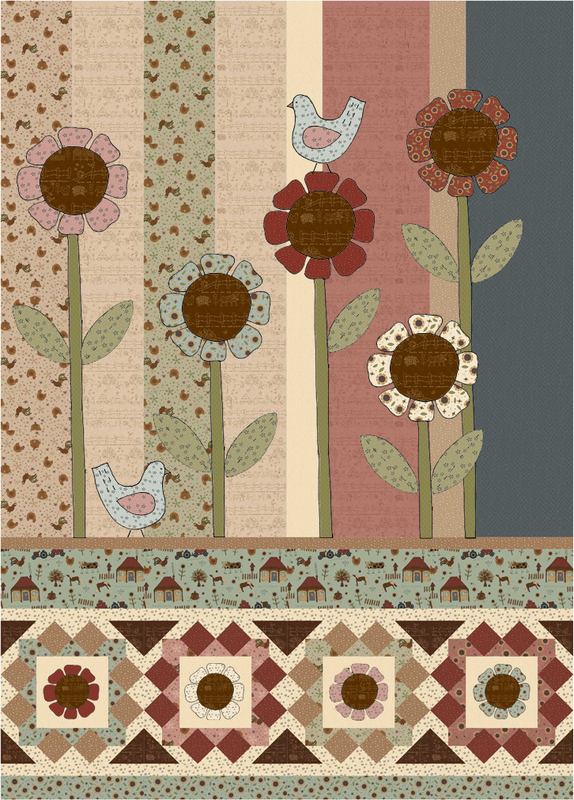 Of course, it looks wonderful with “your” FMQ….but an inspirational design with flowers and sweet birds. I definitely want to make this one. I need to practice your swirly feathers as they are gorgeous and work so well on this design. Sure hope you feel better soon. Another beautiful job! I love this! 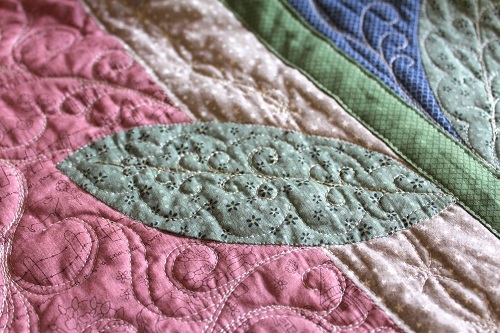 The frilly quilting on the birds tails is over the top! Hope you feel better soon? Any chance of allergies??? This is such a bad time after the horrible winter we had. I totally agree with Peg G. That little birdie is fab!!! 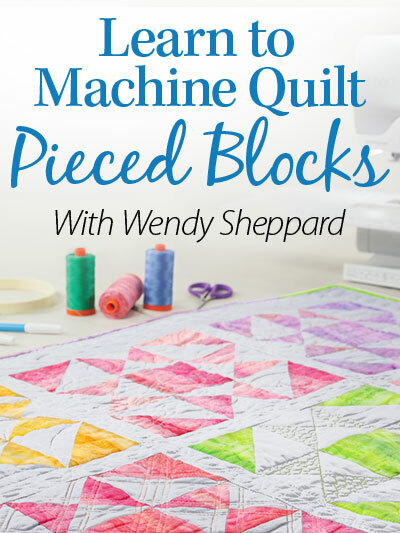 Quilts with applique are always more fun (IMHO) and this one was a perfect opportunity for all your incredible “bag of (quilty) tricks”!!!!! Chicken soup for you????? Sleep/rest????? Ha! Hugs………………..
And then, tonight, I get to start on a new quilt that I hope to finish by tomorrow before I go to bed. Crazy, eh? I really do think I have a screw loose somewhere. Hahaha. I love the feathers around the tail of the chicken and the ” sprigs” coming out of the flowers stems! 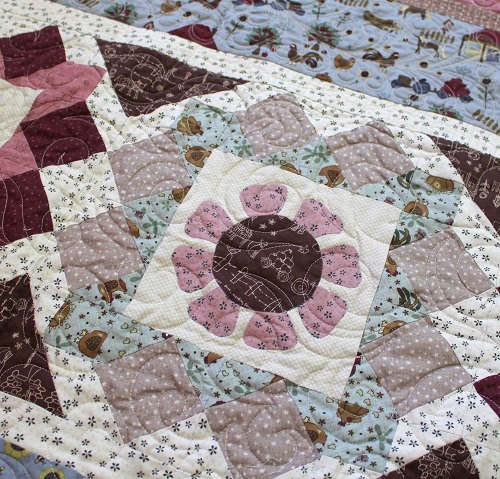 That’s a very cute quilts! Now get all better! What an absolutely fun quilt. I can believe that you had a ball quilting it. Great job, Wendy. WOW! 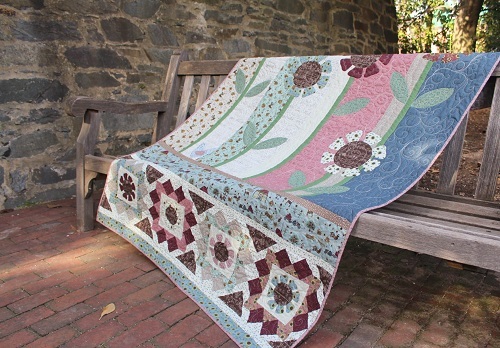 I am speechless after seeing the beauty of this quilt. Absolutely stunning, love the pattern. 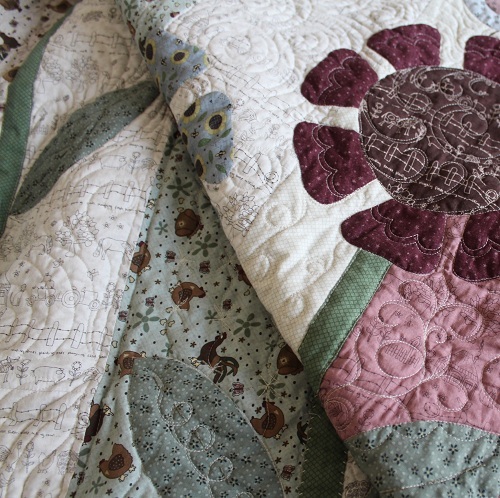 And your quilting is just awesome! 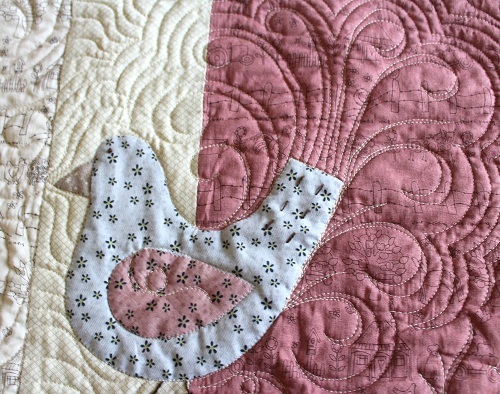 The birds tail which you quilted with swirly feathers is my most favorite! 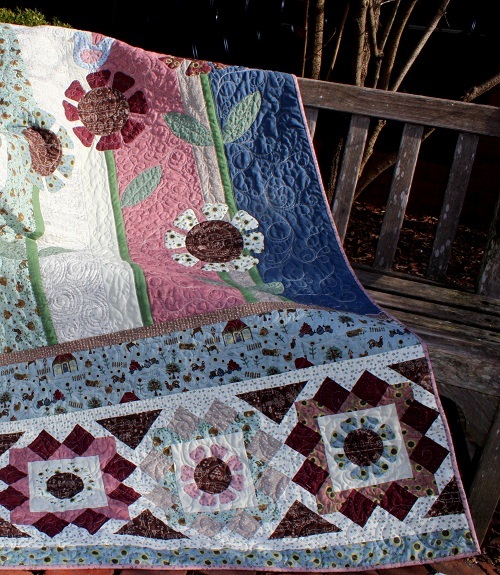 Oh, I love this quilt; it is such fun. 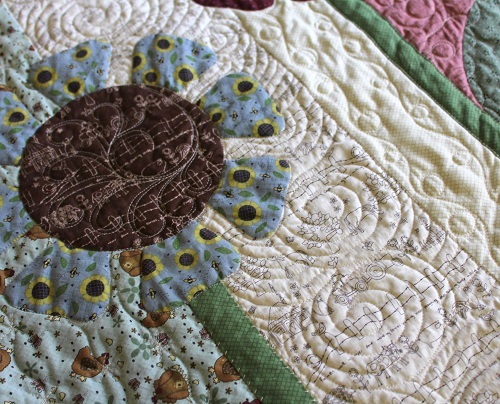 The piecing is delightful, the fanciful quilting really enhances it. Fun, fun, fun!! 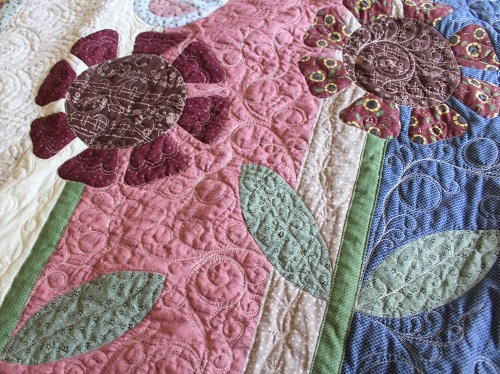 Beautiful quilt, is it hand applique? Do hope you are feeling better now. 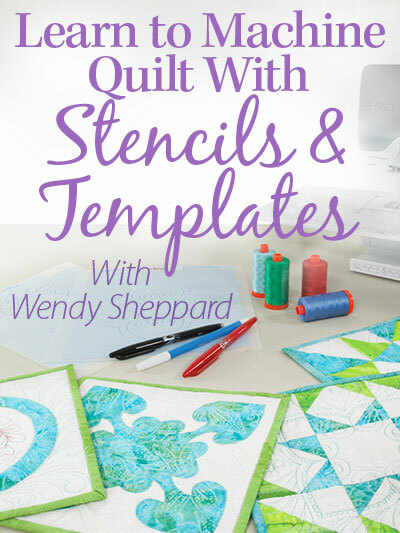 Penny did not drop that this was your quilt Wendy. being in the UK we have had this magazine a while, in fact have the may one too. 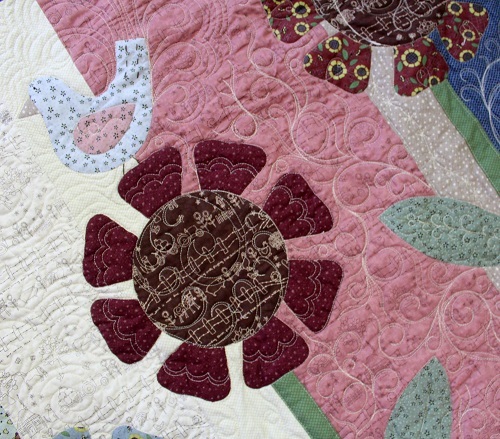 I do love the quilt, the design, applique, and the quilting itself is beautiful. 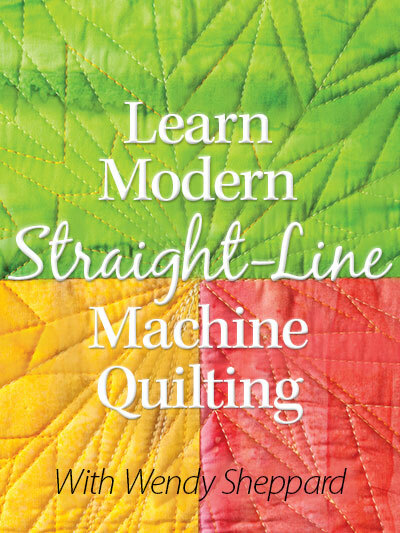 Must get my act together and have a play as still cannot do machine quilting. Seem to have lost the comment I wrote before, maybe it has gone on the blog if so sorry for repeating myself! What a cute quilt, Wendy! The flowers are so fun. I hope you feel a wee bit better today. This is a wonderful quilt. So fun with the addition of the applique. 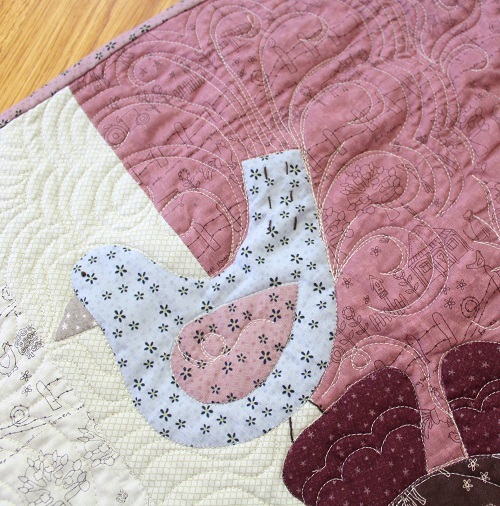 I love your quilting especially the tail feathers on the little bird! I love the vertical pieces with the patchwork along the bottom. I am still looking for this magazine at B&N. Hope you are feeling better soon……there is nothing like orange juice!! This is very cute. I see the fun you had quilting it. I’m having fun enjoying it! Please be well soon. Those tail feathers are delightful! 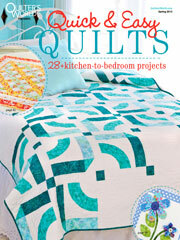 love the quilt and as I live in the UK will be looking for a copy! 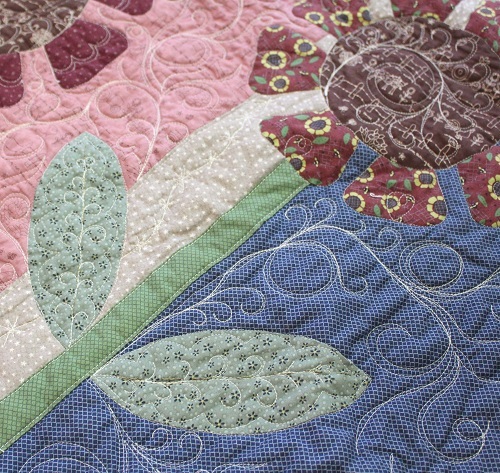 I love the quilting on this quilt. Great job Wendy, as always. as always so gorgeous to look at and what an inspiring work you are doing. I do enjoy reading and looking at your blog each day, thank you! They both turned out fabulous!